1. 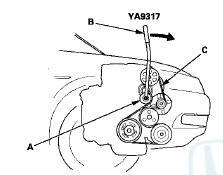 Move the auto-tensioner (A) with the belt tension release tool (B) in the direction of the rotation arrow to relieve tension from the drive belt (C), then remove the drive belt. 2. Install the new drive belt in the reverse order of removal.